Little compares to pure determination, especially in writing. I tap my foot restlessly as I wait for my “writing time” (which is typically between four and six in the evening), eager to let my fingertips click make-believe people, places, and thoughts into existence. We’re amazing, aren’t we? We hold the power to create, destroy, and rebuild as we please. We can valiantly slay dragons, voice those opinions we were too afraid to say aloud, soar to utopias beyond our wildest dreams, win arguments we lost years ago, flawlessly get revenge on all the punks in the world, and all from the comfort of our local Starbucks. But sometimes we lose sight of that. Every so often we falter and stumble, and sometimes we’re even shoved, out of our motivation. Our drive disappears; we question everything we write. We get chased in circles by that big ugly “What If” Beast. What if it’s not what I expected? Man, that Beast can sure be mean, can’t he? But remember a few paragraphs back, when I said we could slay dragons? Just think of the “What If” Beast as another dragon. Stick a sword in his belly and move on. You don’t want to give him the satisfaction of your failure, do you? No! We can defeat the “What If” Beast before he even has so much as a chance to make a home in your mind. Here are five simple ways it can be accomplished. Motivation is the key to productivity and a happy writing life. 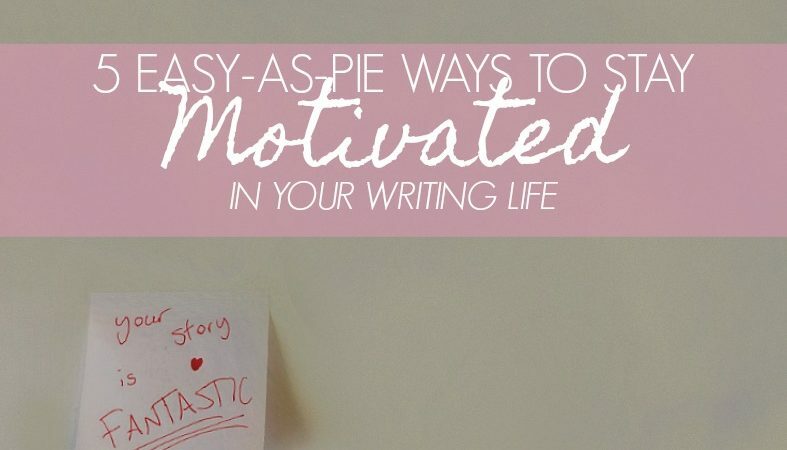 So by staying motivated and doing the whole “keep-on-keeping-on” thing, you are helping yourself write more, write better, and actually finish your novel. Exciting, isn’t it?Let’s get started! Haters gonna hate. It’s a stupid phrase, really, but it bears some truth to it. He used it as a helpful experience, taking it elegantly and without care. Handle the bad reviews like Mr. Goins here. Do you have a Pinterest? Follow-up: do you use Pinterest as a writing tool? Astonishingly enough, the site is just about perfect for any and all writers. If you’ve been here a while, you’ll know I can (and have!) 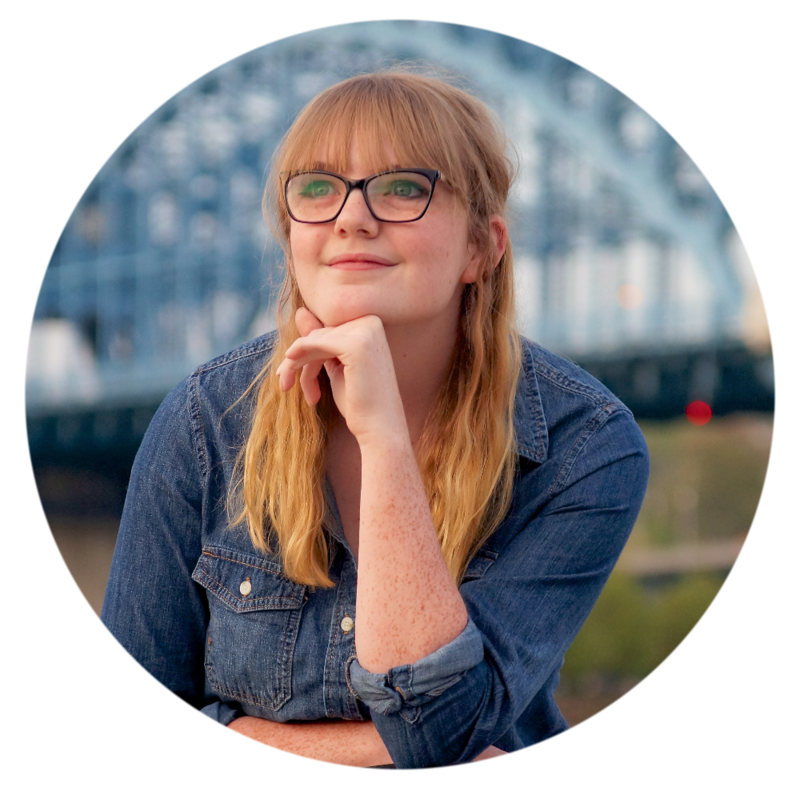 ramble on and on and on about the benefits of Pinterest for writers. I promise, I won’t babble about story-boards today, okay? No, today it’s mood boards. It is just as it sounds: a Pinterest board that portrays a certain mood or feeling. Title it whatever you want and fill it with quotes, pictures, videos, etc. that help you stay motivated and upbeat. I like to load mine up with photos of my favorite colors and foods. In addition to that, you can also build inspiration boards. There’s no official difference between the two, but my inspiration board is mostly photography that piques my interest, while my mood board is designed to make me smile. Although, at the same time, they ultimately share the same goal. Make sense? 3. Create a special playlist. I have a playlist in my phone called “Feel-Good,” and it’s just as it sounds: music that builds me up, inspires me, and gives me the drive I need to get to work. I listen to it every single morning. I always get a little thrill when I find a song that has the potential to make it into my special playlist – it’s like finding an extra french fry at the bottom of the bag, and the fry is still warm and crispy. Or my playlist is the “cool table” and they accept another kid into their posse or something. I don’t know. It’s exciting, okay? 4. Develop a writing routine. Cue cries of protest. Yes, I know! I hated the prospect, too. I always used to skip this step, thinking, Why should I tie myself down so much? Why only write during one particular time? Isn’t that just constraining? I found more recently – surprise! – I was wrong. So very wrong. Contrary to what I thought initially, there are ways to have a freeing, comfortable routine, and it’s surprisingly easy to create one. For me, a “writing routine” is a particular time of day in which I am typically free write every day. I try to give myself one to two hours of time between four and seven in the evening, and just by doing that, I’m able to write consistently, day after day. I’ve written more in the past two months with this routine than I remember ever having written. But at the same time, I don’t feel “tied down” at all, and I remain motivated almost all the time. Choose your favorite and most available time of day. For me, it’s during the evening. If you’d like, pick a “backup” writing time, just in case you can’t make the first one. Preferably make it some time after the first; mine is from eight to nine p.m. But this step is totally optional. Write for a maximum of three hours a day. My average is 90 minutes. This way you don’t overwrite and burn yourself out (which is not what we want). Don’t worry if you can’t make either or any of your “writing time(s)” – there’s always tomorrow, right? So long as you have this “tomorrow will be better” attitude, you won’t stress over your routine. Yes, it’s perfectly normal to procrastinate. I do it all the time, and I’m very conscious of it. While procrastination is, of course, harmful to our writing, I seriously advise you not to worry about it unless it’s literally preventing you from writing at all. But why is having a routine so motivating? “The desire to write grows with writing” (Desiderius Erasmus). It’s literally that simple, writers. PLOT TWIST: You are the “What If” Beast. Yes, it’s true. No one, writers, tears us down as much as we do. We know enough about ourselves to criticize, downplay, and berate the things other people won’t even notice. Which is why this is the absolute, #1 most important step to finding and keeping your motivation as a writer, and why I saved it for last. By building your writer’s self esteem, you’re not only blocking out the negativity (remember step 1? ): you’re setting yourself up for success! All the things previously mentioned don’t work on their own. Yes, they can help. But you need all 5 steps as one to build toward this all-important, game-changing step: accepting and loving your writing. 1. Keep yourself in check. Don’t let me hear you beating yourself up, even if a simple I’m not that great a writer floats briefly through your mind. I mean it. Don’t do it. It’s those little thoughts that are holding you back. You don’t have to worry about them, because you know what? Your writing is always better than you think. And that’s the honest truth! 2. Accept that your writing will never be perfect. Unfortunately, the only perfect thing to ever inhabit earth was Jesus, and your novel is no exception. Neither is mine. Every story, even those classics whose title everyone knows, has something about it that can turn some people away. But that same thing could be drawing other people in! Not everyone will like your story, either. I’ve mentioned this point in several posts already, and here it is again: not everyone will like your story. But some people will, and that’s all that will matter in the long run. No, it will absolutely not be perfect. But it will be pretty darn good. It’d be a shame if I got through a post without something fun like this. To say I love Sticky Notes would be an understatement. I use them about every day. You could walk into my room and get dizzied by the amount of Notes I have. My nightmares are literally about all my Sticky Notes falling off the wall. It’s only natural that I use something I love so much for my writing advantage. So I leave myself inspiring messages everywhere. I should make inspirational posters. Hm. 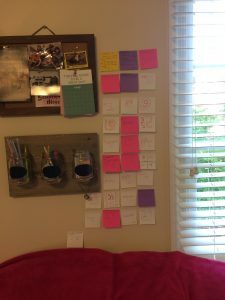 But I’m a writer, which makes me inherently creative, so I came up with a less cliche way to use my Sticky Notes collection. I call it a Victory Wall. Forgive the photo quality. This was taken yesterday morning (August 20, 2016), and yes, you are looking at 30 Notes crammed into one little space. Why? What on earth would prompt me to put 30 Sticky Notes (and counting!) up there? This isn’t a recent thing: I put up the first Note in mid-April. Each one has a number, you’ll notice, because it represents a chapter completed in my rewriting process! So basically, whenever I finish a chapter, I put a Note on my Victory Wall. It’s probably more inspirational than it ought to be to look up and see how far I’ve come in such a short time; I’m about to run out of space! Victory Walls can also be an art form, if you’re itching to use those colored markers you’ve been hoarding. I just like to use my trusty red pen. In addition to chapter-ly Victory Walls, you could put up a Note on a different wall for each novel or project you’ve finished. It’s a slower process, but even more rewarding to watch the wall fill up. If you don’t have any Sticky Notes lying around the house: I seriously suggest picking some up. You can buy them almost anywhere, and they aren’t expensive. Ditch, and learn from, negativity. Use Pinterest boards to build your self esteem. Build a carefree writing routine. Build yourself up by accepting that you are not, and never will be perfect. Sticky Notes are marvelous. Just saying. Let’s talk! How do you keep yourself motivated? Tell me in the comments! Hi, Sam! I love that idea for mood boards on Pinterest! I’ll get on it right away. I saw yours and I thought it was a good idea, but I never got around to it! I need to! Also, I’m going to do that sticky note thing for each chapter! It sounds like an amazing idea! Thanks for the feedback, Aynsley! I’m glad you like the idea of the “Victory Wall.” It’s been surprisingly beneficial this year, I must say. 😉 Good luck with your writing! Oh my goodness, thanks so much! That means the world, really. 🙂 And congrats on your own nomination, as well! I love your blog!